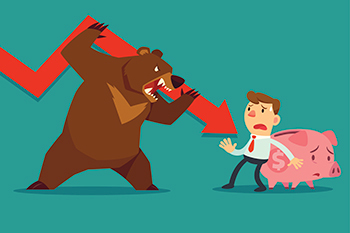 As markets mirror the impact of several socioeconomic proceedings, it often forces investors into an arena of terror, whereby they rush to their advisors to shield their investment from any impending financial doom. We believe that rather than panicking, one must calm down, think rationally and introspect wisely to understand the aftereffect of any market movement. Overreaction is bad for your heart as well as for your investment. Tame your adrenaline and don’t take emotional decisions by witnessing short market turbulence to keep your portfolio safe and unharmed. Experts believe that the movement in the wealth figures often spans over a short period of time and they are figmental. An investor can easily save their money from the market turbulence by staying away from the market on that specific day of shock. The market pundits suggest that during any market gyration, one must resort to an intrinsic calculation by noting all the specifics of the market and wait for the opportune moment to restart the investment. Temporary market spurts and volatility often opens up a new opportunity in front of investors and gives them the scope to drive home a bargain to buy more at a lower price. So be patient and be ready to fish in troubled waters. Split your money among a plethora of various asset classes across equity and debt instruments, including liquid assets for exigencies, all of which will help you to gain ground when you are planning to sell your stocks or equity mutual funds in hostile market conditions. To cushion your assets from any adverse market condition, it is always ideal to shift funds from riskier assets such as equities to relatively stable and risk-free products. Evaluate the market and also analyse your portfolio everyday. This will help you gauge your progress in the market. At the end, you might not find yourself a winner, but you might find your debt portfolio rewarding. So be patient and take ups and downs in your stride. The author, Subhajit Bhattacharya is News Editor, Dalal Street Investment Journal.